This working Roman aqueduct, completed in the fall of 2005 for a home in Dove Canyon, Calif., wasn't built in a day. 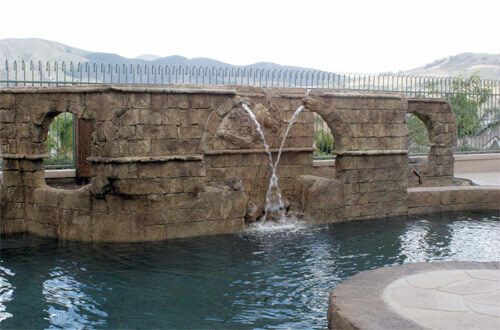 General contractor Suncoast Landscape Construction, of Chino Hill, Calif., hired Richard L. Winget and his firm, Authentic Environments, to install pool coping and 44 feet of aqueduct in a client's backyard, following plans by Pomona, Calif., landscape design outfit KJK Enterprises. The Authentic Environments team, who bill themselves as "artisans and relief sculptors of themed concepts" had to wrestle with the aqueduct concept a bit to get the structure off the ground. "During the design process, we discovered that a six-foot-tall aqueduct would be too overbearing in this small yard and the curvilinear shape of the pool would not blend well with a 45-degree rectilinear wall," Winget says. To tweak the design, Winget and his crew dropped the wall's height by about a foot and put deteriorated-looking ruins in crucial spots. "There is a particular area where the wall comes to a point on the curve of the pool. We could not have the wall cantilever over the pool, so it was decided to indicate a heavy deterioration in this area. This worked out perfectly for the ruin design and became one of the more interesting parts of the project." Authentic Environments started work on the aqueduct after the pool was built up to the gunite stage. The walls were built out of 6-by-8-by-16 CMU blocks, grouted solid with concrete for structural integrity. Forms made from 2-by-4s and bender board set off the shapes of the arches. A decorative frieze, a 2-inch band that goes around the wall, was poured in place. Workers pneumatically nailed 2-by-4s to the wall and screwed form liners onto them, then poured a mix of regular sand and cement spiked with Kel-Crete, a tree-sap derivative that made the mix stickier. As the frieze set, it was distressed, cracked, and broken to simulate the aging of centuries. An Alexander the Great bas-relief was carved out of bead foam, then cast into concrete using the smash-mold method and placed. The rest of the wall was coated with a sand-cement mix built out 2 to 3 inches thick, so it could be carved and made to look real. "The antiquing of the project was, again, based on research," Winget says. "It involved the layering on of colors and washing the wall at the proper moment. When the project was completed, we used an ultraviolet protector to keep the color from fading over time." The aqueduct works. However, instead of transporting water over an open channel like traditional aqueducts do, this aqueduct uses PVC pipe embedded in the top of the wall. "We did not want the pipe visible on the ends, so for the last 14 inches on each side we used the PVC pipe as a spacer," Winget says. "When the time was right, we simply pulled it out."